Brave Combat Federations (Brave CF) president Mohammed Shahid recently revealed that the Welterweight division is soon to have a champion during a LIVE conversation on the official Brave CF Facebook page. Shahid silenced the noise around the topic by announcing Mohammed Fakhreddine vs. Carl Booth will be the title fight to take place in Brazil on August 12th. It did not come as a surprise to most Middle Eastern MMA fans who have watched Fakhreddines performance over the last two years, especially his last two dominant performances under the Brave CF banner. A fighter that puts on a show every time he steps into the cage, Fakhreddine will now get the well earned ticket to crown his career with a world championship title belt. Fakhreddine who was set to make his promotional debut at Brave’s first event was held back due to injury. He then made a different kind of appearance as a commentator in Brave 2. It was there that he witnessed Carl Booth knockout Gadzhimusa Gaziev in Bahrain. In the post fight press conference Fakhreddine called out Booth and the latter showed full readiness to make it happen. The pressure is all on Booth when it comes to experience, as Fakhreddine has previously fought for other organization titles, despite not being of the same weight. Before a fight, it is a normal for fighters to stress but it doubles up when the stakes are high. The event will take place in Curitiba, Brazil. 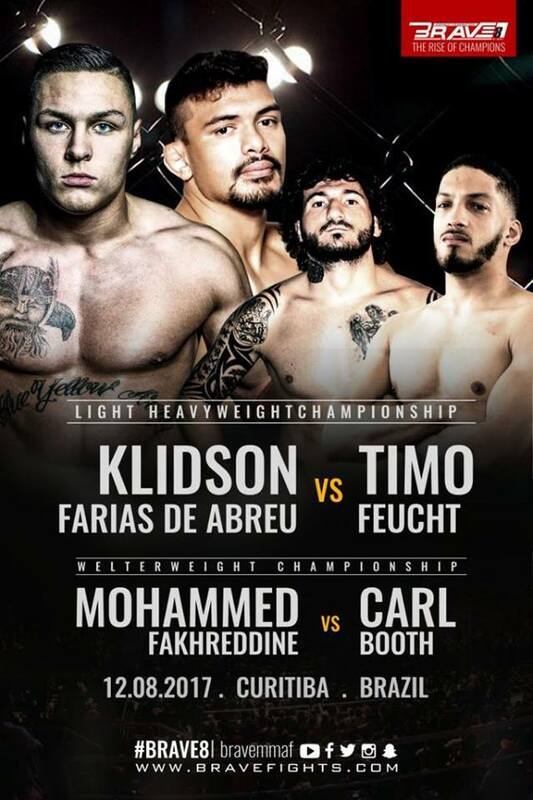 The main event will feature the Light Heavyweight championship title fight between Klidson Abreu (10-2-0) from Brazil, and Timo Feucht (6-0-0),from Germany. This will be the second time Brave CF head to Brazil, and the first with two title fights on the card.